Operators can apply nutrients across a 70-foot area at up to 30 mph with the new AB485. The AB485 Air Boom option has been introduced for operators of the F4365 High-Capacity Nutrient Applicator from John Deere. With this addition, producers will have more control over the application of fertilizer, and they will be able to boost efficiency by ultimately covering more acres each workday. With the air boom option, dry fertilizer can be applied across a 70-foot swath at speeds up to 30 miles per hour. It also provides maximum rates up to 1,200 pounds per acre at 10 miles per hour. Up to two products at variable rates can be applied simultaneously. "The air boom option gives commercial applicators and large farming operations even more flexibility when using the High-Capacity Nutrient Applicator for many types of dry fertilizer applications in their operations," said Doug Felter, product marketing manager for John Deere application equipment. "It combines application speed and accuracy with the comfort and power built into the F4365, thanks to the John Deere PowerTech™ PSS 9L engine and IVT transmission that provides more power to the ground and greater acceleration compared to competitive four-wheel machines." The strength of the AB485 is enhanced with its stainless steel construction. A simply designed air distribution system delivers fertilizer from the dry box through the booms evenly. Section Control and AutoTrac™ allow operators to accurately and efficiently disperse fertilizer as needed. The AB485 will come factory-installed on new 2018 F4365 machines. 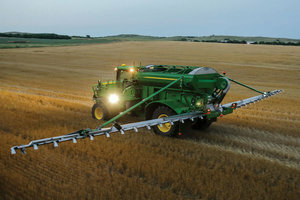 For more information on the new AB485 Air Boom option, contact your local John Deere dealer or visit JohnDeere.com/ag.